We all know that Santa is a really busy guy at this time of year so we are pleased to announce that the jolly fellow will be stopping in Downtown Orangeville during his pre-Christmas tour! Santa will light the Town Christmas Tree and visit with his fans during Moonlight Magic and the Tractor Parade of Lights on Friday, November 16th. Join us between 6:00 pm to 9:00 pm for lots of great family fun including David Nairn’s reading of the Twas the Night Before Christmas, musical and dance performances, the Tree Lighting, live street entertainment, Tractor Parade, some great shopping, and of course, some one on one time with Santa! Enjoy a hot chocolate while you stroll Broadway or pause to watch a performance or two, pop into Town Hall for free face painting & caricatures, and catch a ride on the horse drawn buggy. Downtown Merchants are anxious to show you some of the perks of great local holiday shopping and to show off their great gift ideas for everyone your list! Come out and celebrate small town living and enjoy the charm of Moonlight Magic and the Tractor Parade of Lights, Downtown Orangeville’s classic holiday tradition! 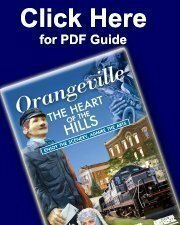 Visit Downtown Orangeville.ca for a complete event listing.